It is not often that you meet a fellow enthusiast for the Père Lachaise Cemetery in Paris – but more of that later. Having recently joined the Friends, this was my first experience of a Friends’ evening talk, and so I was not sure what to expect and approached the evening with a degree of trepidation and excitement. The event had been so popular that it had to be moved to the Birmingham and Midland Institute (BMI) in order to accommodate everyone, so clearly the topic was of significant interest. The evening started off with a very convivial glass of wine and pizza before we sat down to listen to David’s presentation. It was reassuring to see so many people there and interested in the topic, as my experience to date had been that expressing an interest in cemeteries at a social occasion can be taken in the wrong way and lead to isolation! David’s background is public and social history and, as he explained, the way societies deal with burial tells you an awful lot about that society, its culture and its beliefs. Before focusing on the Victorian period we had a good summary of burial practices from the Neolithic period, through the Middle Ages and up to the eighteenth century. 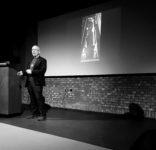 The concept of ‘Memento Mori’, artistic or symbolic reminders of mortality as used in burials, was central to David’s talk which was beautifully illustrated throughout with a range of pictures. Suddenly all those symbols that you have seen in fourteenth century tombs, Cathedrals or Victorian cemeteries start to make sense. We will come back to an explanation of some of the symbols after a short digression. By the end of the eighteenth century and into the nineteenth century, a combination of population growth and urban expansion meant church cemeteries were getting extremely overcrowded. Our own St Phillip’s has an estimated 80,000 burials alone, hence the high level of the ground; it does makes you think twice about eating your sandwiches there. St Martin’s had expanded into Park Street to ease matters, which is currently being excavated in preparation for HS2. The solution to this overcrowding was the concept of the garden cemetery, which brings us back to Père Lachaise in Paris and our own Key Hill (Non Conformist) and Warstone (Anglican) cemeteries in Birmingham. 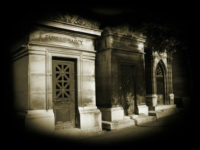 On a spring afternoon in Paris there is nothing better than setting off for a stroll round Père Lachaise. Maps are for sale as you go in, with a guide to all the famous people buried there. Much visited is Jim Morrison (The Doors) who will be familiar to those readers of a certain generation. 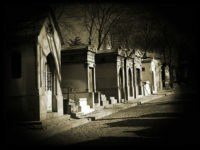 In Parisian culture it is seen as quite a normal and respectable activity to while away an afternoon viewing all the tombstones, many of which are architectural masterpieces in their own right, and enjoying the beautiful gardens. Closer to home, David recommended Key Hill and Warstone in the Jewellery Quarter, a short hop on the tram, both of which give an insight into Victorian Birmingham and the significant families that shaped our city. David concluded with a detailed explanation of the key symbols used in the Victorian period and further recommendations for visits. The evening finished with a lively question and answer session, as the presentation had stimulated much interest amongst the audience. We all left the event better informed and with a greater understanding for a leisurely walk around Père Lachaise, or closer to home in the Jewellery Quarter. Angels are a seen as a symbol of spirituality. They guard the tomb and are thought to be messengers between God and man. Cornucopia symbolises an abundant and fruitful life. Cherubs are angelic and signify innocence. Dogs represent loyalty, fidelity and vigilance when used on tombs. Lily of the Valley represents purity, innocence and virginity.